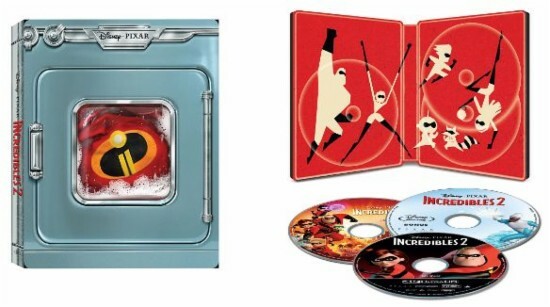 As you may recall, Best Buy announced a couple months ago a Blu-ray SteelBook for Pixar’s Incredibles 2 that had rather perplexing and ugly artwork. Zavvi has finally revealed the art for its competing SteelBook, which looks decidedly better. You’ll lose out on 4k with this one, but gain 3D if that matters to you. I frankly don’t get this at all. The case is clearly supposed to look like a washing machine. I haven’t seen the movie yet, so I don’t know whether it really has an important or at least notable laundry scene in it. Even assuming that it does, this is an overly jokey and dumb choice of art. I think I would be embarrassed to put this on my shelf. 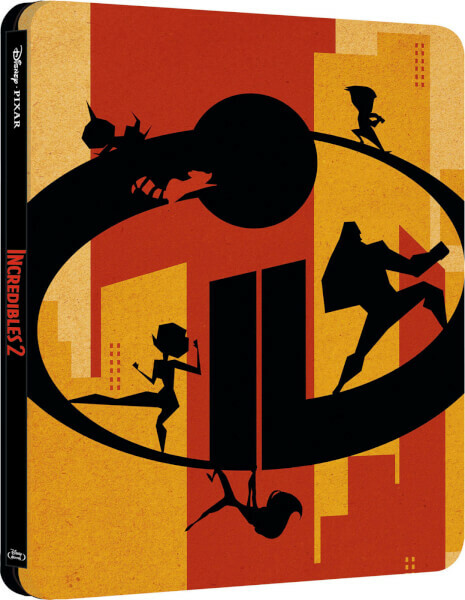 When Zavvi initially put up temp art with just a generic Incredibles logo on it, I feared that the final design might wind up being identical to Best Buy’s. Fortunately, it’s quite a bit different. True, this is perhaps a little Pop Art-y (our forum moderator Krawk has already voiced his hatred of it), but I think it looks fine, and I can’t usually stand Pop Art. The particular style used here suits this franchise pretty well, in my opinion. 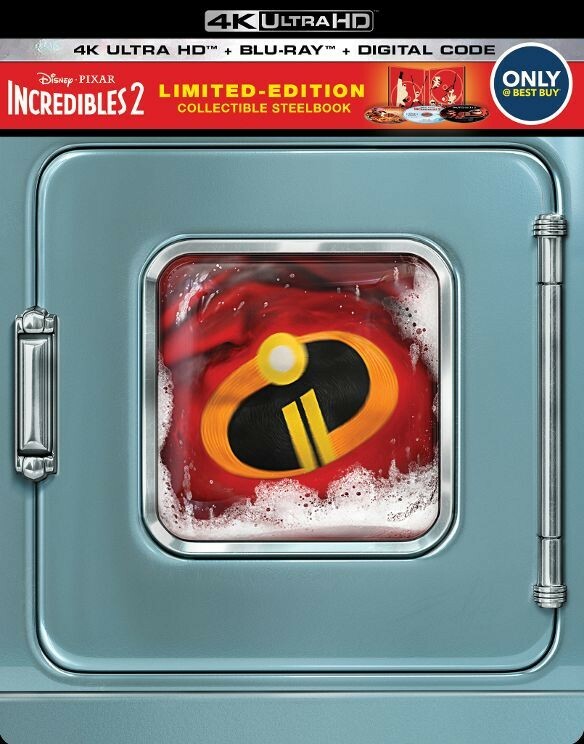 You’d think that Best Buy would choose the similar artwork for Incredibles 2 for consistency, rather than the washing machine foolishness. Anyway, I put in a preorder for the Zavvi release before it sells out. 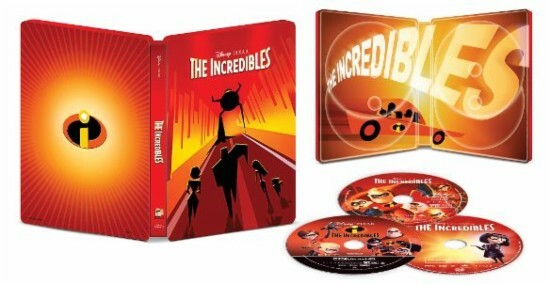 It probably helps that 3D is something I’m still interested in, but even if I weren’t, I’d probably still buy this SteelBook, and then separately buy an Ultra HD copy of the movie to put into the case. Not gonna take UHD seriously until it can ALSO do 3D at the same time. The industry’s general treatment of 3D, something I’d wanted for decades, is one of the biggest screw-ups in their entire history. From what I understand, a 3D Blu-Ray’s content is basically double the info per frame, so it is doubling the file size. Can something long and 3D, like one of the Hobbit movies, fit as an UHD 3D file on one UHD disc? Do the most basic UHD players have enough throughput/bandwidth to process that much data, along with UHD audio? A 3D Blu-ray is about 1.5x the file size as the 2D version. Much of the info between the two eye views is identical and only needs to be stored once. There is no 3D in the Ultra HD spec. Thank you for clearing that up! Would the maximum bitrate of an UHD movie that is 1.5x the usual UHD size be too much for the UHD hardware standard to handle? Most movies fit on a dual-layer 66GB disc, so theoretically, most 3D movies could fit on a triple-layer 100GB UHD disc. It’s basically a moot point, as the UHD Alliance made a conscious decision to not support 3D in their format. There is no intention of ever supporting it. 3D is a non-starter on Ultra HD. i was kind of hoping they’d take the opportunity to release the 3D conversion of the first movie the same time. They spent a fortune converting it and it seems crazy to not try to recoup any of those funds. I remember Brad Bird being quoted as saying it looks great in 3D and he can’t wait for people to see it.